I love cranberry season because that means I get to make fresh cranberry sauce for the holidays, but I don’t stop there. 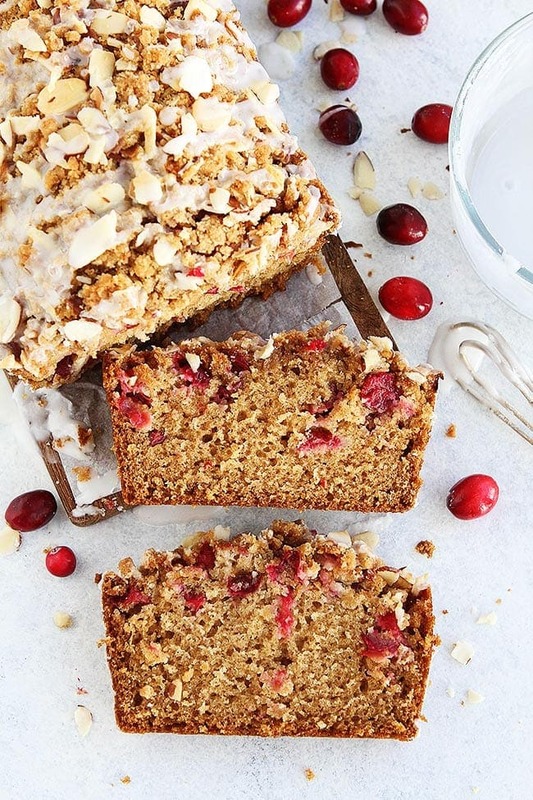 Cranberries can be used for lots of delicious recipes, like this cranberry bread. It is one of my favorite holiday recipes and I think you will love it too. As soon as I see fresh cranberries at Smith’s, I stock up. Did you know you can freeze fresh cranberries? Yep, they freeze beautifully, so buy a couple of bags and stick a few in the freezer. I know you are going to want to make several loaves of this cranberry bread. It is a holiday favorite! 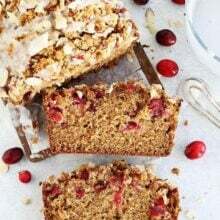 This cranberry bread is special because it is taken up a major notch with an almond streusel topping and sweet almond glaze. The cranberry almond combo is divine! 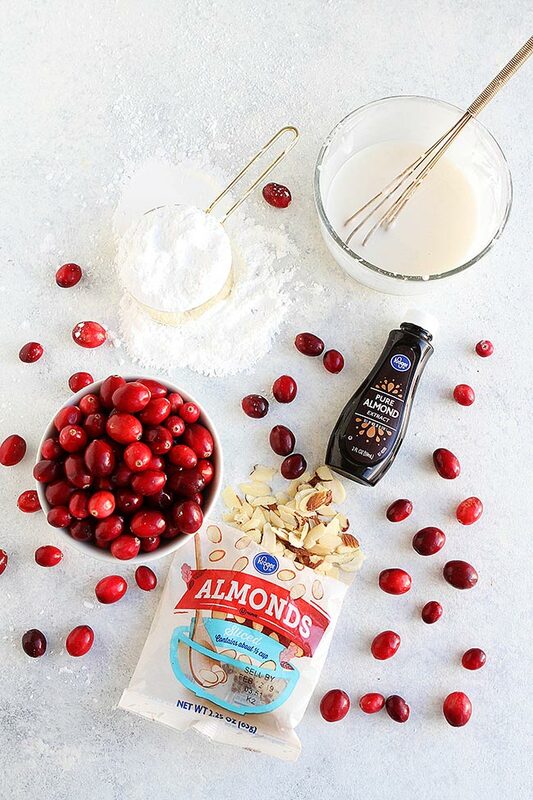 To make the cranberry bread, first make the almond streusel topping and set aside. Next, whisk together the dry ingredients in a large bowl and set aside. In a medium bowl, whisk together the brown sugar, granulated sugar, and egg. Whisk in the almond milk, oil, almond extract, and vanilla extract. 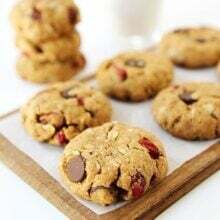 I like to use Simple Truth Unsweetened Vanilla Almond Milk for this recipe. It enhances the almond flavor and I always have it on hand. You can use buttermilk if you don’t have almond milk. Don’t skip the pure almond extract, it gives the bread the perfect almond flavor. Add the wet ingredients to the dry ingredients and stir until combined. Don’t over mix. Stir in the chopped fresh cranberries. 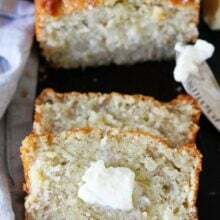 Pour the batter into a greased loaf pan and top with the streusel topping. Bake for 50-65 minutes or until a toothpick inserted into the center comes out clean. Let the bread cool in the pan for ten minutes and then carefully remove from the pan. Let cool completely on a wire cooling rack. When the bread is cool, whisk together the almond glaze and drizzle generously over the top of the bread. Use a bread knife to slice the bread into thick slices and serve! I love making this fresh cranberry bread during the holidays because it is festive and so delicious! You will love the pop of tart red cranberries inside of the sweet bread. You will get a hint of almond from the bread, but the streusel and almond glaze seal the deal and will have you coming back for another slice. 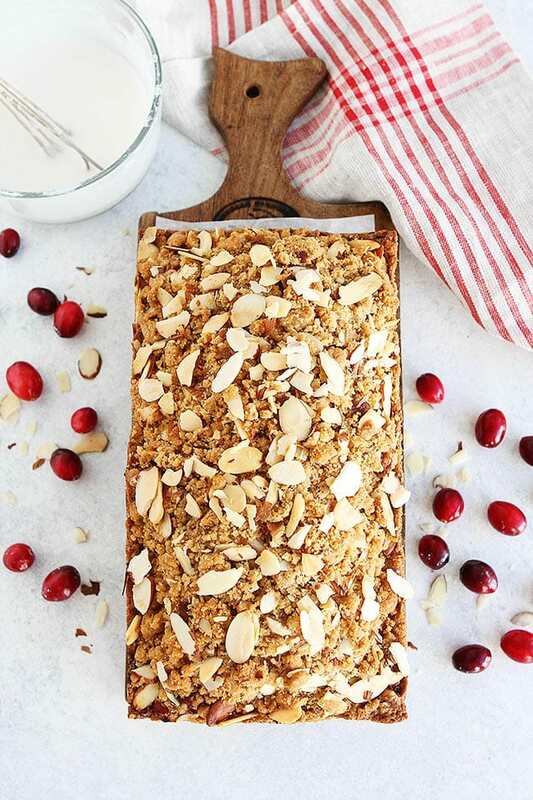 You can serve this cranberry almond bread for breakfast, brunch, or even dessert. It is the perfect thing to bring to any holiday party. You can also give away loaves to neighbors, friends and family! 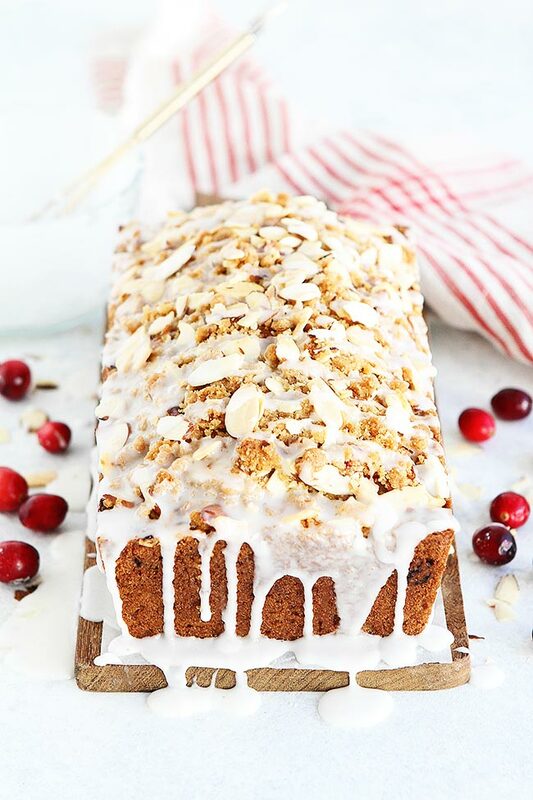 Cranberry Bread with an almond streusel topping and a sweet almond glaze! 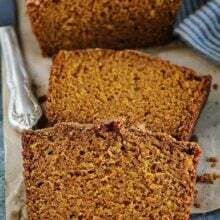 The perfect quick bread for the holidays! Preheat the oven to 350°F degrees. Grease a 9×5 loaf pan with nonstick cooking spray. Set aside. First, make the streusel topping. In a small bowl, combine flour, brown sugar, cinnamon, and cold butter pieces. Rub the mixture together with your fingers until combined and crumbly. Gently stir in the sliced almonds. Set aside. In a large bowl, whisk together the flour, baking soda, salt, and cinnamon. Set aside. In a medium bowl, whisk together the brown sugar, granulated sugar, and egg. Whisk until smooth and there are no brown sugar clumps. Whisk in the milk, oil, almond extract, and vanilla extract. Slowly pour the wet ingredients into the dry ingredients and gently whisk until there are no more lumps. Don’t over mix. Fold in the chopped cranberries. Pour batter in prepared pan. Sprinkle the almond streusel topping evenly over the bread. Bake for 60 minutes, loosely covering the bread with aluminum foil after 30 minutes to prevent the top from getting too dark. A toothpick inserted in the center of the loaf will come out clean when the bread is done. Remove from the oven and allow the bread to cool for 15 minutes on a wire cooling rack. Use a knife to loosen the bread around the edges in the pan. Carefully remove the bread from the pan and cool completely. To make the glaze, combine the confectioners' sugar, almond extract, and almond milk in a medium bowl. Whisk until smooth. Drizzle the glaze over the cooled bread. Slice and enjoy! The bread will keep covered on the counter for up to 3 days. Can freeze the loaf for up to 2 months. Just wait to glaze it. Defrost the bread and then glaze. If I don’t have the almond milk, would you suggest using buttermilk in the glaze also or should that be standard milk? Use standard milk for the glaze. Mmmm, I’ll take a slice! Can you use melted butter instead of the canola oil? De-lish! I was looking for a recipe that satisfied my sweet tooth whilst not being a full on cake, and this was the ticket. I’m not a huge fan of cranberries, so I substituted them for raspberries (but left the rest of the recipe the same) and found that it worked a treat. The almond streusel on top really tied the whole thing together, and I can’t wait to make this again once the first batch is demolished! Thank you so much! This was the perfect treat! Looking forward to making it again! I used plain yoghurt instead of buttermilk and could not find almond essence so left that out.